You with the giant-size C*stco bag of pre-fab pasta and chicken and chemicals? That’s not food. And it’s not really saving you nearly as much time as you think it is. An alarming number of us think of cooking as this inscrutable, difficult, mysterious process. And when we struggle with ingredients we’re not familiar with and not comfortable using? It turns into one of those stories our spouse’s tell when they’ve had few too many cocktails. It doesn’t have to be that embarrassing. I promise. So here’s the thing: Writers, all too often, eat like crap. While I find it a source of great amusement that I’ve earned a reputation for pulling chicken nuggets and fish-sticks out of the hands of total strangers with an appalled, “What are you doing?! That’s not food!” There’s an element of real truth to that reputation. I’ve actually been known to do just that. It’s just not that hard, though. If you follow a couple of really simple principles, you can cook damn near anything. You’ll feel better, you’ll eat better, and you might even have some fun. That said, it’s a good thing to learn to identify some basic ingredients in their natural state. So let’s talk about greens. Do we need to talk about why you should be eating green things? I don’t think so—it’s one of those things that we all know, like “smoking is bad” and “that 42 ounce soda is not our friend” and “bacon makes everything taste better.” No matter what you serve, if you serve a mess of greens alongside or underneath it, you can point and say, “But look! Greens! Healthy!” Then you can go away feeling virtuous about your eating habits. I have a huge fondness for greens that can stand up to other strong flavors and textures, so no wimpy bagged spinach or delicate endive for me; give me a bunch of dinosaur kale or collard greens and I’m a happy woman. You don’t even need a local farmer’s market or a Whole Foods Paycheck; your local mega-grocery or Super-W*lmart is going to have a bunch of terrific greens in the produce section, year-round. You don’t even have to stress out about buying organic, unless you’re doing penance for eating Big Macs, take-out pizza, and microwave burritos all week. No matter where you get them, when you go shopping for greens, you’re looking for big, crisp, deeply-colored leaves that aren’t discolored or wilted and aren’t sporting a tiny herd of wildlife. Bring those greens home and wash them. Don’t even put ’em in the fridge. If you put them in the fridge, you’ll talk yourself out of even trying this, and you’ll stick ’em in the back of the crisper and avoid remembering you even have greens until after they’ve turned to squidgy black pulp in a bag. 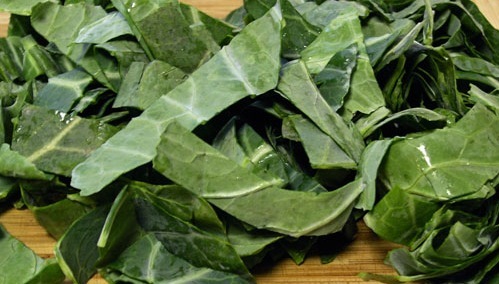 Thoroughly rinse each leaf under cold water, and toss your greens in your biggest colander to drain. When they aren’t dripping anymore, pull the thickest parts of the stems out of each leaf. You can do that with a sharp knife, or by folding the leaf in half lengthwise and pulling the stem out by hand—doesn’t matter how you do it, as long as you end up with a nice pile of green, coarse, de-stemmed leaves. Pile those clean, de-stemmed leaves on a cutting-board, take a clean knife, and shred them crossways into coarse ribbons. Center the pile of shredded greens onto a big piece of heavy-duty foil, drizzle a couple of spoons of good olive oil all over them, then sprinkle a teensy bit of salt all over ’em. If you have a lemon handy, whack it into quarters and drizzle lemon juice over them (or use a spoon of the lemon juice from concentrate out of that little plastic lemon-bottle in the door of the fridge—that’s fine, too). Fold the foil around that pile of greens into a tight packet and toss it into the oven for twenty minutes or a half hour. This isn’t an exact science. What you end up with is a packet of tasty, zesty greens with a ton of flavor and body. You can serve them as-is, or use them as a bed on which to serve roasted chicken, fish, shellfish, rice, or garlic-mashed potatoes. MacAllister Stone is Editor in Chief of Absolute Write. She attended Viable Paradise X in October of 2006. Since she has very little spare time and less sense, she thought head-wrangling an online magazine of speculative fiction called Coyote Wild would be the perfect remedy. She can often be found on the Absolute Write forums. She blogs sporadically at Stones In the Field, Floccinaucical, Sofa Monkeys, and Creating Home. Amen on short ingredient lists and minimally processed foods. It’s also cheaper, in the long run, if you’re having to go the starving-artist route. I remember I used to like kale – I’ll try this and see if I can get greens back in the diet. 4 oz. finely cubed Panchetta (or Prosciutto, or good ham). A dollop of butter or olive oil to get the pan going. 12 – 16 oz. opinionated greens. I use arugula. 6 – 8 oz. (or more; it depends on your greens) heavy cream. 1 – 2 cups finely grated fresh Parmesan or Pecorino Romano. Wash the greens. Get the pasta going. Put the butter or olive oil into a big heavy-bottomed pan and fry on medium heat, stirring frequently, until lightly browned. While that’s cooking, loosely chop the greens. When the Panchetta and walnuts are browned, add the greens and keep stirring until the greens collapse. Add the heavy cream and stir until (a.) 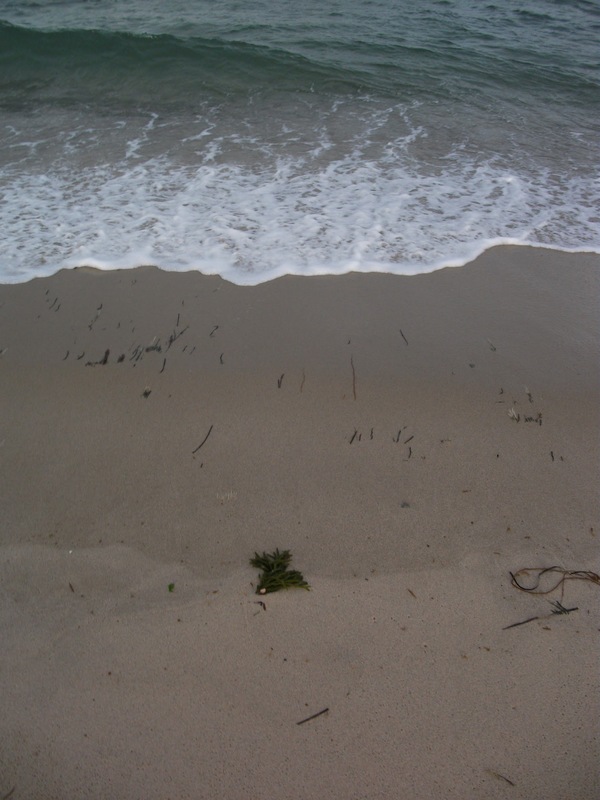 just short of boiling; or (b.) it thickens a bit, if you prefer (call it a minute or three); or (c.) it looks like it would be good on pasta. Add enough cooked pasta to take up the sauce. Dish it out into bowls and lay on a generous amount of grated cheese. Don’t just sprinkle the cheese over the whole pan of pasta and greens, or it will pull the greens out of the mixture and glue them together into a ball. Serves two to five diners, depending on how hungry they are. oh great recipe! Thank you Teresa! Chalk it up to the unnatural stress produced by specifying actual amounts. See, I knew I should feel virtuous about adding a bunch of spinach to my Thai delivery soup! I have a bad habit of buying greens and not eating enough of them. Except for kale chips (basically this recipe, but not wrapped up). Those will make me eat a whole bunch of kale by myself. Sylvie, you are always virtuous – and that’s a great idea with the soup. Thoroughly wash the outside of the squash. With a sharp knife, you cut the squashes in half and scoop out the seeds with a spoon. Be careful — the rinds can be very tough. If you prefer to peel it, you can, but there’s really no need to. Brush about a tablespoon of olive oil over the exposed squash flesh, and sprinkle very lightly with salt. The easiest way to cook your squash is to pop it into your oven for a half hour to 45 minutes, or until soft but not gushy. Take the squash out of oven and let it cool while you do other stuff. The other thing you can do is pop the squash halves into a deep non-stick pan with a lid, with about an inch of apple cider mixed with vegetable stock (or water works, too), cover with a lid and let it gently simmer until tender, adding more liquid as needed. Your choice. I like roasting because the squash caramelizes a bit. While your squash is cooking, it’s a good time to thoroughly rinse your kale, remove the stems and any heavy ribs with a sharp knife, and shred it into pieces that can be comfortably handled with a fork. Put the chopped kale in your colander and let it dry. Whisk the Balsamic vinegar with a quarter of a cup of olive oil until thoroughly combined. Season with salt and pepper to taste. Place your kale in a large bowl and toss with half the vinaigrette mixture. Don’t be gentle with the kale. You can actually massage the vinaigrette into the leaves, and it’ll be all the better for it. You can buy pomegranate seeds in most upscale grocery stores, in the produce section — but what fun is that? Instead, take a whole, ripe pomegranate and, with a sharp knife, carefully halve it, then quarter it. Don’t wear a white shirt while you’re doing this. Fill a two-quart bowl about half or three-quarters with cold water. With your hands, very gently separate the pomegranate seeds from the rind and membrane, letting the seeds drop into the water. (The seeds sink while the membrane floats.) After you’ve got all the seeds separated, remove and discard the rind and white membrane and strain the water off the seeds in a very fine strainer, then pour ’em onto a couple of layers of paper towel so they can dry. Toast your pine nuts (or hazelnuts or pecans) in a dry skillet over medium heat for 4 or 5 minutes, just until they’ve lightly browned and start to smell rich and nutty. Don’t leave ’em or turn your back, because the little monsters will burn faster than you’d believe. Keep the pan moving to toss and stir them often. If that all sounds like way too much work, you can also just spread the nuts into a single layer on a cookie sheet or pie pan, and roast in a 350°F oven for 6 ­or 8 minutes until they’re lightly browned and you can smell them, stirring them at about the halfway point. Either way, once cooked dump the toasted nuts off of the hot pan and onto a plate, to stop the cooking process. Let them cool. Cook more than you need, because everyone who walks by while they’re cooling will eat some. With a sharp veggie-peeler, you can shave a bunch of curls of cheese off of the block of Parmesan, and set aside. Gently, gently, gently! Otherwise you have Parmesan crumbles. If that happens, no worries – just garnish your salad with crumbles of cheese instead of curls. When the squash has cooled off enough that you can comfortably handle it, cut it into bite size pieces.You don’t have to be fancy about this, just utilitarian. You can either peel it, or let people do that for themselves, it’s up to you. Arrange the squash pieces in a single layer on a deep platter or in a shallow salad bowl. Drizzle the left-over half of your balsamic vinegar and olive oil mixture over top of the squash. Layer the squash with the kale, then sprinkle with pomegranate seeds and toasted nuts, and garnish generously with your Parmesan shavings (or goat cheese crumbles). So did you make the salad? How’d it go? We had a small kitchen coup, with the junta declaring it was her turn to cook tacos. The salad has been pushed into this week’s lineup, barring further unrest. I know a better way to turn a pomegranate into pomegranate seeds: cut it in half and hold it cut side down over a big bowl, then whack it on its back with a wooden spoon. The seeds will rain down into the bowl AND you’ll feel much cheered by the whole process. Or you can do what my Welsh grandmother used to do and sit quietly in your favourite arm chair and pick each one out with a pin, and eat them one by one, just like that. My mom scored the pomegranate and then submerged it in a bowl of water, then peeled… and rubbed any extra seeds loose with her fingers. No nails, ladies and gents, you don’t want to make the poor tender darlings bleed. I don’t have enough hand strength to feel safe cutting up a winter squash. My preferred method: poke a hole in it with a gimlet so it doesn’t explode, then microwave until it softens. Cut it up, scoop out the seeds, and finish cooking it as you prefer. This is what we do as well. Lesson learned trying to make pumpkin soup one year. Only TNH would think of poking a hole in a squash with a cocktail. To think that I squelched my squash trepanation joke all week, and completely missed the opportunity for a cocktail quip. Bear is sharp. I was terrified of butternuts until I bought a cleaver. And I keep it super sharp. If you cut a nice stabilizing chunk off one side so it sits steady, you can proceed to hack that sucker up super easy. If for some reason you ever feel the need to cut a winter squash before cooking it, the tackly little pumpkin carving saws they sell around hallowe’en work remarkably well without requiring a lot of pressure. They do leave a fairly messy cut, though. I usually stab my squash with a knife tip (enough to pierce the skin, but not stab all the way through) and then microwave, unless it’s a pumpkin, in which case it’s usually big enough it has to go in the real oven anyway. That totally works, too – (we don’t have a microwave, so it’s not real practical here at home) – the main thing is to get those lovely scorch-carmelized edges. Meantime, saute garlic over medium heat in olive oil for 1 minute. Don’t allow to burn. Add kale and stir to coat. 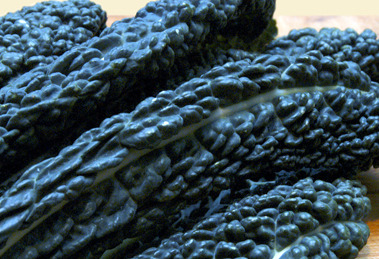 Pour balsalmic over kale, then stir-fry or cover to cook down for 1-2 minutes. Sprinkle with kosher salt. Toss with pine nuts. Toss linguini with olive oil and plate to serve. Portion kale on top of linguini. Top with parmesan. Yes! This is almost identical to my go-to method for cooking kale, though I typically use red wine vinegar rather than balsamic. Side dish with everything. Take some bacon grease. (Or olive oil if you don’t have bacon grease in the fridge.) Melt it in a pan on medium hit, and then toss in half of the kale. (Or collards, those work too.) Stir it around until it’s all gone limp, then scoop it out into a bowl, add a bit more bacon grease, and toss in the rest of the kale. Once the second batch of kale is done, put the first batch back in the pan with it. Add about half a cup of water (or chicken broth if you have it about!) and let it boil for a bit (if you have a lid, you can put that on to speed the process). Once the kale is how you want it (my kids like it softened up a bit more than the usual), scoop it back out of the pan and serve it forth.